6. 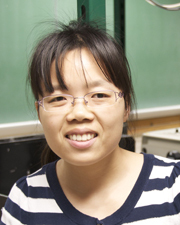 Rui Wang, Hui-Chun Chien, Jatinder Kumar, Nardeep Kumar, Hsin-Ying Chiu*, and Hui Zhao*, Third-Harmonic Generation in Ultrathin Films of MoS2, ACS Applied Materials & Interfaces 6, 314-318 (2014). 5. Rui Wang, Paul Jacobs, Hui Zhao, and Arthur L. Smirl*, Quantum Interference and Control of the Dynamic Franz-Keldysh Effect: Generation and Detection of Terahertz Space-Charge, Applied Physics Letters 102, 251110 (2013). 4. Rui Wang, Brian A. Ruzicka, Nardeep Kumar, Matthew Z. Bellus, Hsin-Ying Chiu*, and Hui Zhao*, Ultrafast and Spatially Resolved Studies of Charge Carriers in Atomically-Thin Molybdenum Disulfide, Physical Review B 86, 045406 (2012). 2. Brian A. Ruzicka, Rui Wang, Jessica Lohrman, Shenqiang Ren*, and Hui Zhao*,Exciton Diffusion in Semiconducting Single-Walled Carbon Nanotubes Studied by Transient Absorption Microscopy, Physical Review B 86, 205417 (2012). 1. Alec Kirkeminde, Brian A. Ruzicka, Rui Wang, Sarah Puna, Hui Zhao, and Shenqiang Ren*, Synthesis and Optoelectronic Properties of Two-Dimensional FeS2 Nanoplates, ACS Applied Materials & Interfaces 4, 1174 (2012).